Ghoulish Fun for a Halloween Main Course! Celebrating Halloween originated with the ancient Celtic festival of Samhain, when people would build bonfires and wear costumes to ward off ghosts. This ancient ceremony was known as All Hallows Eve, and over time the celebration has evolved into our modern-day Halloween. Get the whole family involved in designing their very own jack-o-lantern and it will quickly become one of their holiday favorites. For added nutrition, serve with ghoulishly delicious roasted green beans. Although we’ve lost the original meaning behind the celebration, Halloween is now a family-friendly holiday we associate with carved pumpkins, creative costumes, spooky houses, and lots of sugar. Enter any store in the coming weeks and the first thing you’ll probably see are displays filled with every type of candy imaginable – just what our teeth, well-being, and already energetic kids need! Admittedly a good portion of my favorite Halloween treats are filled with sugar, but every year, I strive to make a Halloween-themed dinner that also has some nutritional value before sending the kids off to trick-or-treat. 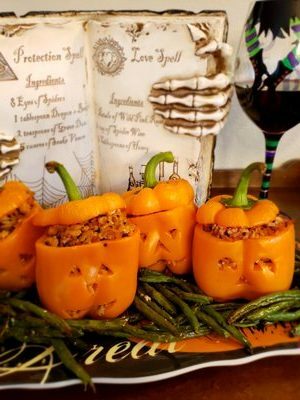 Jack-O-Lantern Stuffed Pepper Pumpkins is one of my favorite dishes, and can be served as a main course or a side dish to supplement the festivities! 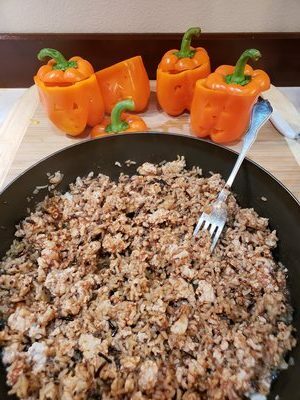 You can fill these peppers with wholesome ingredients like brown rice, ground turkey and sweet peppers, and kids love them because of their festive look. 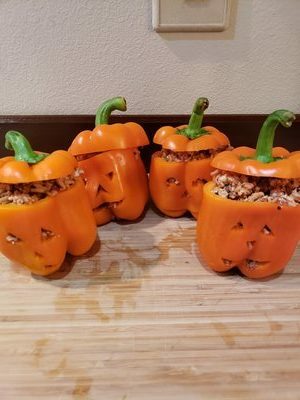 Let your kids carve their own face into each pepper, and they’ll definitely be on board with this festive dinner idea. Hope you enjoy! Let your kids have fun creating their own jack-o-lantern face. Wash peppers. Slice off top of pepper and remove core and seeds. 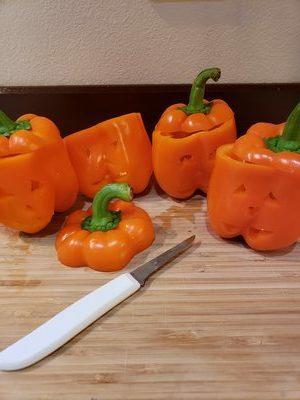 With a sharp paring knife, cut jack-o-lantern faces into peppers. In large skillet, combine ground beef (or turkey) onion, parsley, paprika, salt and allspice. Mix well and cook until browned. Remove from heat. While ground beef is cooking, combine ½ cup tomato sauce and chicken broth to small saucepan. Bring to boil. Remove from heat and set aside. 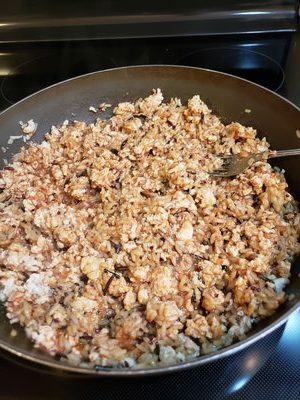 Add in rice, ½ cup of tomato sauce and Parmesan cheese to beef mixtures. Mix well. Spoon about ¾ cup of beef/rice mixture into each pepper. Place peppers in a 2-quart baking dish, coated with cooking spray. Add remaining broth/tomato sauce mixture to bottom of baking dish. Cover with aluminum foil and bake 30-40 minutes, or to desired doneness. Uncover and bake an additional 5 minutes. Create more fun and let your kids stuff their jack-o-lantern.